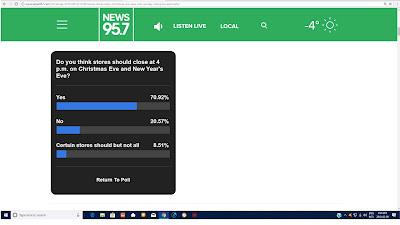 Poll on News 95.7 FM supports a closure at 4 pm on both Christmas Eve and New Years Eve. It's been a year since,I have published on this blog. You can view most of our posts by going to the Save Our Sundays Facebook page. Last year we went to Walmart in the city just before Christmas Eve and on the way in , I noticed that Walmart had a sign up closing at 8 pm on Christmas Eve. This broke my heart to think a company could be so heartless opening their stores up past 5 pm. This year Walmart was under a lot of pressure and they decided to close their stores at 6 pm instead of 8 pm. This still isn't going to satisfy me or any of the workers who have to work this late. Even when the store is closed, it's an hour before everyone leaves to go home. If you attend a church service, many churches do have earlier services. Being open this late stops their employee's attending a service if they want to go. Setting the religion aspect aside , not everyone attends a service and celebrates it as a holiday and are home with their families. It's not a religious issue,when all levels of government are home on Christmas Eve and New Years Eve. When we want stores open we don't use the phrase Happy Holidays, we then call it a Christian holiday as an excuse to open up the stores to shoppers. How convenient it is to direct these comments at retail workers and no one else. I spoke about Christmas Eve and New Years Eve in a local paper. I also had the opportunity to speak on Country 100.7 FM and CKBW FM about closing stores on Christmas Eve and New Years Eve at 4 pm . Communication is so important, we do not do enough of it in the retail sector. How often have you heard that we are treated like third class citizens? If we do not tell the public or the companies who we work for that this isn't except able, they will continue to treat us this way. On December 22, 2017 I had the opportunity to speak on The Rick Howe show ! Today, I went live on Facebook, so please listen to what I have to say and please sign our petition and share it. Let's make retail a happy experience for workers, time off, a better living wage etc. To make good changes , speak out and get involved. May you have a Happy New Year and a healthy and prosperous one! It's time the Nova Scotia government steps in to legislate Christmas Eve and New Years Eve to close at 4 pm. Walmart has announced it's Christmas hours for December this month and has decided to extend their hours to 8pm in the evening. We all know when Christmas is too prepare for it, since we have a year in advance to prepare and to make lists to buy for the people we love. This is so wrong to put pressure on low income workers to work on Christmas Eve, when so many spend time with their families and attend church services. Millions of people are off on Christmas Eve, while retail workers once again are being treated with no respect with all the hard work that they do for their companies all year around. Retail workers work hard leading up to Christmas for the companies that they work for. Many workers start work early and go beyond their duty to help people when they are off , while shopping at their store, that they work for. Not all workers have their families that live in the same area and have to travel to another province or country to spend time with them. This is an attack on low income people in this province. Why should someone ringing groceries in be treated any different than someone delivering a letter? Or someone working in a bank? Or a talk show host? Our MLA's , Our premier? This is the year 2016, and we treat low income people like this? We are asking the Nova Scotia government to also include Christmas Eve and New Years Eve in the right to refuse to work legislation. 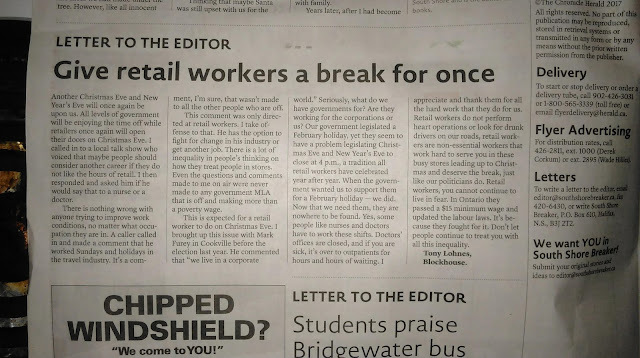 The reasoning for this would be if the store is closed , all workers would still have the right to say No! Business owners should also by law be legislated to post these rules in their staff rooms for employees to see. Since no one is told about their right to refuse to work Sundays or other Statatory Holidays. 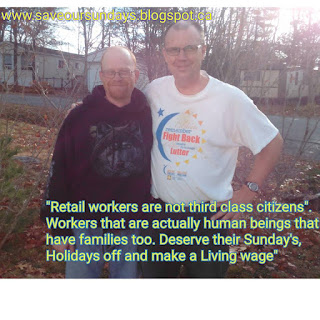 Retail workers are people too, please speak out! How many kids will be disappointed with no mom or dad or both? How can you get a baby sitter on Christmas Eve ? No Buses will be running in the city, it's Christmas Eve (HELLO) This is not the Nova Scotia, that we want. Theirs a time to shop and it's not on Christmas Eve, it's time to be with the people you love. Repect store closures on Christmas Eve and New Years Eve. I love life and people and are asking this question? Why are you beating a dead horse? I've decided to write about just that and why? Do you give up in life on anything knowing it is so wrong ? Morally ? Illegally? I've spoken up on this issue on radio, TV and glad I had the experience with this. I've learned it is never easy to go on radio and tell the public how you feel about any issue and it didn't come easy for me, not in the least. 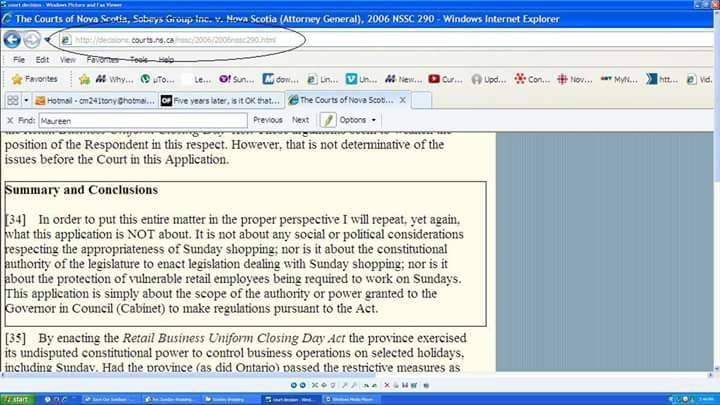 I remember going into province house with an MLA at the time, Mark Parent. There were all kinds of speakers there, a small corner store owner, church speakers etc, that took a turn speaking. All the major networks were there. CBC, ATV and Global. Was it easy to speak on Camera? Easy answer "NO" it wasn't. I was never so grateful to have an interview on radio with Rick Howe a talk show host on News 95.7FM. I remember that day clearly and all the events that lead up to it and after. I've watched the media mislead people into thinking that the courts struck down the ban on Sunday shopping, which never happened. I've watched the public getting misled to believe that the plebiscite on Sunday shopping wasn't binding, which wasn't true. I've watched the media and business tell Retail workers that they would get more hours of work and that it would create more jobs. This hasn't happened either. Workers are pushing all over the globe for 15 dollars an hour (minimum wage). WHY? If Sunday shopping were so profitable, we wouldn't need a big raise, we would be getting it now. It's funny our provincial government decided to give themselves a raise, no fuss about this what so ever? Do you hear comments that inflation will increase because government gave themselves raises? Do you hear comments from people, the media when a CEO gets an increase? Will this make inflation rise? It's interesting to note, that retail workers not only lost their Sundays, they're working seven days a week on poverty wages. If things are not getting worse for low income people, go to some stores where self serve check outs are popping out everywhere. Why is there any need of them? It's taking away jobs from workers that need it. IT's funny to watch people actually ringing groceries in for free. You already paid for that service to have someone wait on you. Now they have you working for nothing and putting someone out of work. Are retail workers asleep? Business's, the media pounded into you're heads that you're going to get more hours, it's going to create jobs by having Sunday shopping. Companies are taking from you and what are you doing...short answer, one word “NOTHING”. It's heart breaking to see that know one seems to care anymore. Workers need a time to have a break and rest from being in these stores. I've watched retail workers being compared to other occupations like restaurants, coffee shops etc. They work on Sundays, what makes you any better? So if you buy a new car, does this mean I have to buy one too?? Games that were played and pounded into retail workers heads over and over. To make them feel like third class people! That workers should be working 24/7 because Jack forgot to buy his loaf of bread. It's brutal all of these mind games that were played on people. The media helped carry out this assault on low income earners. Instead of giving other occupations Sundays off, which the government could have done. They ignored a democratic vote. Do you know how serious this was? A vote! Binding Vote! People died for us so that we could have that choice to vote. Gave their lives up for all of us. They also gave their lives up for us, so that we could give an opinion. An opinion that we should not have to live in “FEAR” about giving one! You're all doing that in the retail sector. Outside the government and the media, churches didn't play big role in the Sunday shopping plebiscite after a decision was made by Rodney MacDonald's government to allow Sunday shopping illegally. Churches didn't speak out about this! A VOTE that was binding and a decision by the courts that didn't rule on the Retail Uniform Business Act. Churches are run like a business, they are not preaching about the Sabbath anymore. It's not even mentioned! Since when did “GOD'S WORD ” change? They speak about young people not attending church anymore! How can they? When they have no other choice but to work on Sundays, because they are told that they have to work. Whether you believe in God or not. It's not the point I'm trying to make. No one is doing anything or speaking out for the little people. The little people are losing it all ...everything. I don't care if it's the Girl Guides promoting a day of rest. A day without traffic, a day to spend with Mom and Dad or Grandma or Grandfather. It's not about you shopping, it's about what was taken from us, when you have SIX other days to do it in. So many services are offered in Five days. Why can't store's close down just for 1 day? Our environment is going to the dogs. Wells were going dry, we're having floods, heat waves and wild fires etc. Yet people continue to shop with these stores being open day and night with their lights on? How is this saving the environment? How is encouraging traffic on our roads seven days a week helping the environment? These are the many reasons why I'm speaking out. I'm hoping that some day before it's too late, workers all over the Globe wake up. Quote of the day “ It's sad to watch people get scammed and equally sad to see they don't realize it". You have been scammed by government and business. Be proud and fight for you're kids for a better future. Their campaign went even further and it's attack on the church congregations. 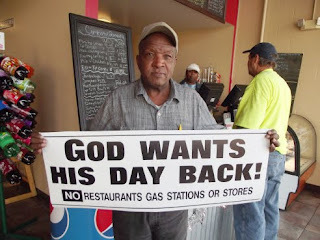 Why is it OK for church members to eat out on a Sunday and not go shopping for groceries? Over and over this was pounded into their heads, making them feel guilty for restaurant, Tim Horton workers, etc, who had to work Sundays. Workers that originally chose to work on Sundays, when they were hired to work these shifts. Government could have made a decision and included them in the Sunday shopping ban. Government could have also asked workers in this occupation if they wanted to be included into a ban. Corporations did an excellent job playing one occupation off against another and using church members making them feel guilty over something that wasn't their fault. Christians are supposed to be caring people, wanting to help and support you! How is this possible, going to church then out shopping on a Sunday afterward? Church minsters are ignoring “God's” word and no longer preaching about the day of rest. You can't learn anything if it's not taught. The public was always told you can't legislate common sense! It's quite obvious you must have to legislate common sense! If everything were left to the business owner to open and pay you, what he want's to, you'd be working seven days a week for 2 dollars an hour. Quite amazing how big business is controlling media, government and “YOU”. Before the Sunday Shopping plebiscite in 2004, I remember the debate about accepting gay marriage. Back then on radio or who ever spoke with me, it was always been thrown up in my face! Why is it OK that you don't work a Sunday while someone at a movie theater has too? At that particular time I did feel guilty, until the gay issue came up. I scratched my head!! Hmm! People were told to accept them because they were different. This had me thinking, what about the millions of other workers in retail that never worked Sundays? Should they have to work because other occupations do? My answers to so many questions were answered. I could see how we all were manipulated, put down and expected to work to serve people on a Sunday, because people had nothing better to do. I realized I'm a person too, I realized that other workers felt just like I do! But no more, I realize that we was scammed by the 1% who wants us to work for nothing seven days a week. 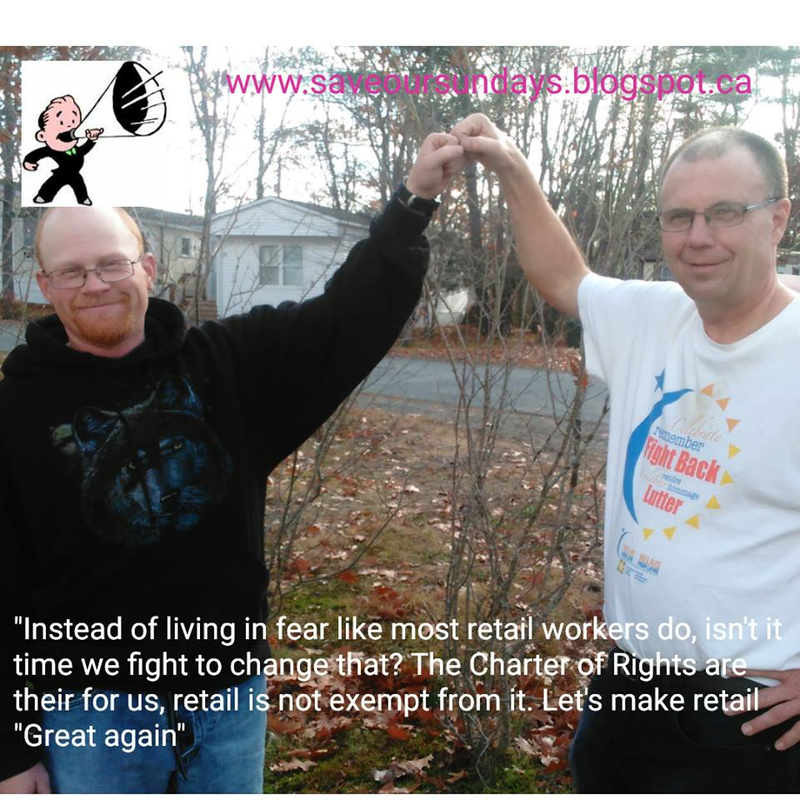 Retail workers are people too, and it's high time things change for the better. How about Sundays and all Holidays off? How about a living wage? We haven't progressed at all in this country, we need to learn how to “STOP”. Not to believe everything they tell us on TV or at work. It's all about making money and if we do not fend for “ÜS”, no one will do it. I'm fed up with the way retail workers are treated in general, like we are slaves of the system, to wait on you even if it's a holiday. It doesn't seem to matter. Never let someone make you think that you do not deserve any of these basic needs in life! Retail workers you deserve a hell of a lot more than what you are getting. Don't let people put you down or make you feel like nothing. There is no difference between a letter carrier or a cashier. You all have been programmed to feel that retail workers are low class paying jobs. If you do not like it, get another job. Not thinking about the poor guy or girl who takes their place. That will have the same problems. If you do not have a good living wage, you can not eat healthy and end up sick at the hospital. Taxpayers foot the bill for sick people, while CEO's make more money off the backs of hard working low income earners. Rest is required (Sundays & Holidays) so that workers get lots of rest and get time to spend with loved ones. Less stress could mean less time at outpatients. Just imagine getting power from muskrat falls in Newfoundland when we have it already here, but wasting it! Lights on in stores around the clock seven days a week. If we are so darn concerned about the environment, how can we simply dismiss it? As you can see there are several reasons as to why we should go back to a ban on Sunday shopping. Over all people in retail stores aren't treated like people by the media, by their business's who they work for. It's like you are third class citizens. This is the 21st Century and we actually treat people like this? A governments job to me is to look after it's citizens and not turn their backs on them. If corporations are that greedy to pay their employee's a decent wage and provide them with Sundays and Holidays off, government has failed you. It's their job to help those people who can not help themselves and have legislated law providing these things to all retail workers. I'm sure I'm being judged on my opinions on this subject and like many others, that have opinions are judged as well. When you are afraid to give an opinion because you're boss might see it or someone who might not agree with you. There is something seriously wrong with that picture. We want to teach young people not to be afraid to give an opinion. We want to teach them the proper way to speak and give an opinion. I'm not suggesting trashing your employer on line. Just because you work for someone, doesn't mean that they own you and that you can not speak freely about any issue. That is what's wrong people! Retail workers are living in fear and scared to share their opinions. Today I'm telling you as a worker you are “NOT” a third class citizen. Our country, business's have you pounded to the ground. This is the 21st Century, people died in wars for us to have that right to vote! They died for us, so that we can speak freely and give an opinion. We're not doing that! Why celebrate Canada's Birthday? If you are too scared to give an opinion and you live in fear to what you're boss might think, what other people think. Tell me is this the kind of society, you want to leave to your kids? Seriously? The majority of you reading this may say I'm all full of BS. No, I'm not supporting a government that lied to you, business's that lied to you. I'm not supporting the media, who didn't tell you all the truth to what had happened. Just because the majority of you forgot about this, doesn't mean it's right. Stephen Harper, the majority of you voted for him and guess what? It's your fault, just like you all voting for Justin Trudeau, who is putting our country into debt. Point being, the majority isn't always right! Today I'm telling you that the majority of you let our government get away with honoring a democratic vote! A court that never ruled on Sunday shopping. Yet you are all silent about it, supporting the 1% who are making and forcing people to work on Sundays for poverty wages. Retail workers you are people too, Don't let people put you down. You're no different from someone working at a government office. You're no different from a MLA who is off on a Sunday or a holiday. If we want change and we should we have to fight for it. A few examples in the USA, workers are fighting for 15 dollars an hour and have been successful in some US states. Workers have also been pushing for stores to close on thanksgiving in the USA. Workers have convinced some business's to close its doors on thanksgiving. So never under estimate you're potential, instead of taking the easy route out and doing nothing. Please share this blog and let's make Canada, USA great again. Let's bring back family values, increase wages, legislate time off on Sundays and all holidays. Let's make life better, after all this is 2016! It's been awhile since I wrote an article for my blog, life has a way of passing you by doesn't it? I don't know if any of you watched this video on You tube or not? It's worth watching and it's not done by Save Our Sundays. The Lie that we Live - https://www.youtube.com/watch?v=ipe6CMvW0Dg . It's not hard from my eyes when I watch that video, that the corporations control all of us. The 1% are controlling each and every one of us. My blind folds are off are yours? 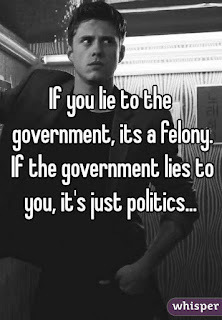 You're government lied to you and we let them get away with it. When I watched the"The Lie we Live" by Spencer Cathcart, it reminded me of my battle. How can we possibly care about the environment ,when we don't care about ourselves any more? We don't care about gathering with our families any more? 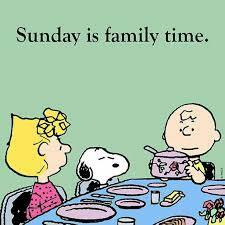 A day to bond and spend together as a family?I'm disappointed in the media who completely misguided the general public on what really happened with Sunday shopping. The churches, have you noticed no longer mention the day of rest any more? Have you noticed that the unions, all government parties also ignored and didn't talk about what really happened? The best way for a politician to get around all of this is one word....silence. Don't say anything. Not mentioned on CTV, CBC or Global people! Lied to YES we were. The courts never struck down anything, BUT we continue to support these corporations and media THAT lied to you. You're out shopping making someone work for less than 15 dollars an hour making the 1% rich seven days a week. Just to make a point how corporations can persuade you to do what they want anytime, just look at those self serve check outs. Do you know you're still paying the same amount of money whether you have someone to wait on you or not? You're told that if you do not want to wait in line to go to a self serve check out. Hello people, they are getting you to work for them for free and putting someone out of a job. You're making that 1% even richer by supporting that. These corporations also persuaded you to think that other occupations had to work on Sundays, like restaurants , call centers etc, so the rest of us should have to work on Sundays too. Instead of pushing for legislation to give other workers the same rights, we were played off against one another. People isn't it time we wake up? Distractions like this new Pokemon Go game are to keep us all from the real issues at hand. The lie that we live, we are living it each and every day. Just remember a future with a day of rest and a good environment is a good foundation to live for. Question at the end of the day, are you going to continue to "Live the Lies that we live"? Are we going to continue to think it's acceptable for our politicians to continue to break promises? These people represent you and when they ignore and don't answer questions, what does this tell you people? Here's another challenge...this is to all political leaders , MLA's and our premier. 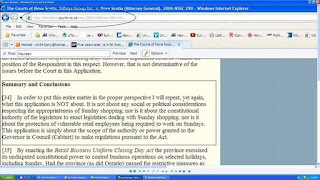 I'm trying again, will you please come clean and tell Nova Scotians the truth about Sunday shopping? Please !!! I never fought Sunday shopping for religious reasons, but having said that we all learn something every day that we are here and blessed to be on this earth. I've noticed as time went on with Sunday shopping it wasn't just about some one's right to shop, but what was taken away by having it. I don't see any corporation or government promoting a day of rest or a family day, which we used to remember them by being called "Sunday". With the exception of a few companies that do honor a day of rest, Chick-Fil A and Hobby lobby. People wanted churches out of there lives, and now that churches are out of there lives, they do not preach about the day of rest any longer. So who's going to preach about that now? The government? Retail stores? Who? It's no wonder we have the problems that we do today. If it's not taught it can not be learned. It does not matter to me if the girl guides teach us about it. How can families bond with the pressures of everything being open seven days a week? We are a society that seems to accept the government when they do wrong and dismiss and forget it. The Sunday shopping plebiscite a prime example. A vote ignored by the wishes of Nova Scotians. So what do we do? Nothing! We accept what the government did to us morally and legally. If any of us stole or broke a law where would we be? Would we get away with it? Would you accept it? 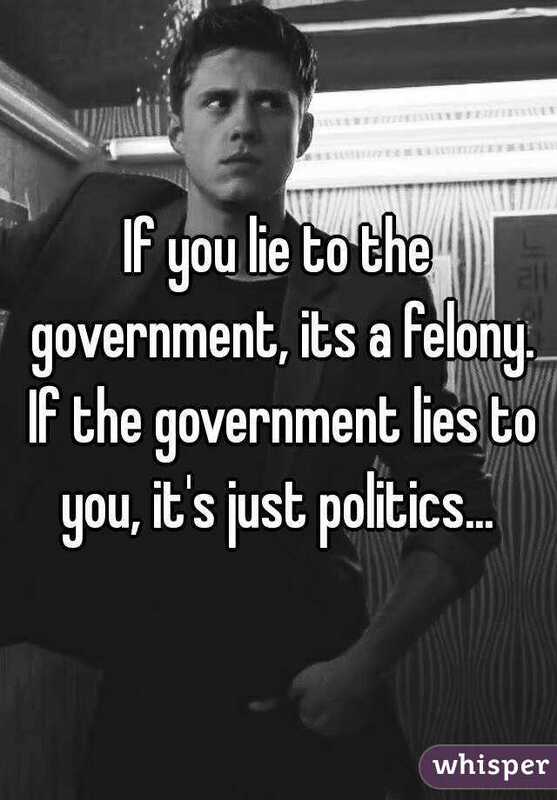 Like you do with the government? 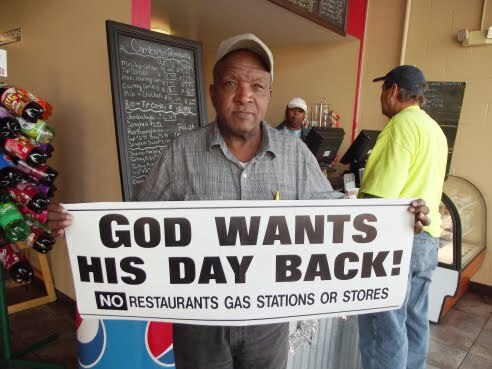 A Pastor Willie Lark, Sr out of MI would like us to support him and calling on all Christians to stop shopping on Sundays. You don't have to be a Christian to support this pastor, It doesn't matter if you are an atheist , you still need down time to spend with you're families. Retail stores that were closed on Sundays , were often compared to restaurants , call centers, coffee shops that were open on Sundays. We were told that "we're no better than them". That we should work too! Seriously?? So if you buy a new car, we should all buy one too? What always bothered me, the fact that we were all played off against one another. One occupation against another occupation, you know divide and conquer to get what you want. The problem could have been solved very easily. Why not offer restaurants, call centers, coffee shops and all other non essential workers Sundays off? Why? Our province, should be supporting this pastor, who cares about what's happening to our families today. It goes well and beyond Sunday shopping. Look at how people treat one another now? No one is bonding like they used to , no one is having that family get together like we used to. But today, who's in charge? The religion of business? There target is to make money seven days a week. Not promoting a day of rest. Not promoting family time. Not promoting any holiday. If they could open holidays in our province, the stores would be open in a heart beat. Corporations do not care about the environment either. It's all about making millions for the CEO's of this country. Seriously...are we not concerned to where this country is going? You wanted God out of you're lives, look who's in charge and what they are doing to you. I've seen a lot of deaths lately, showing us that life is too short and precious. Showing me that days like Sundays are special and that we need that time to be together. Bonding should not stop after birth, it should continue in our lives. Sunday shopping is destroying that. We used to have a unique province that stood out from the rest of Canada. It's sad, lets make a stand two ways, support this pastor out of the USA and pressure our government to ban Sunday shopping. Hey we can do with out shopping when we have a snow storm or a power outage. Surely we can do it one day a week. Surely we can do it for the workers who don't want to be there on a Sunday. Happy Easter, this may be a uphill battle, but if you can not have an opinion..it doesn't say too much for the country we live in. Have a great day and thank you for reading. Please share and support our American pastor out of the USA. How many of you listen to the Rick Howe talk show? The Rick Howe show was quite interesting last week as a sugar tax on sugar drinks have been discussed . Rick supports this tax on the drinks to combat it. As I listened to the show, while going for my jog at HB studio, I remembered at one point in time , Rick was strongly opposed to Sunday shopping. But now he is out shopping on Sunday , like it's another day. Yes sadly it is , because we let it be this way. Now my point about a Sugar tax and Sunday shopping. By allowing these stores to be open illegally on a Sunday, because the courts never ruled on Sunday shopping and it was a binding plebiscite, we opened the doors to other problems. It's another day people for you to shop, it's another day for you to buy sugar products that are obviously addictive. This is why a ban is necessary . These products are put at eye level, it's to entice you to buy more of these products. We are living in a society, that thrive on our addictions. It's a profit maker, this is why we have so many people over weight. Yes you can be over weight by going the other six days a week. By allowing stores to be open another day , has only added to the problems we have today in our society. Are you outraged? If you are not outraged , you're not listening. Are you outraged Rick Howe? Are you listening Rick Howe? Are we awake in Nova Scotia? How can we continue to let our province continue in that slippery slop? Families no longer bond and have family dinners together. Families go out and buy unhealthy foods. At what costs? Our health care system and we all pay for it. Our families who should be on top of our lists, not the bottom. It's the religion of business who's destroying life as we see it. Wake up Canada...Wake up Nova Scotia. Workers do have this right to refuse, companies scare them into working Sunday shifts. After reading an article on line - Michigan Pastor Calls On All Christians To Stop Shopping On Sundays http://detroit.cbslocal.com/2015/11/30/michigan-pastor-calls-on-all-christians-to-stop-shopping-on-sundays/http://detroit.cbslocal.com/2015/11/30/michigan-pastor-calls-on-all-christians-to-stop-shopping-on-sundays/ . I'm thinking about this issue in another light. I've never fought Sunday shopping under a religious issue. After reading the article and the Pastors request, I'm wondering why the majority of Ministers are so silent about Sunday being a day of rest? You never hear them preach the Sabbath, you never hear them encourage Sundays to be family days. It's like the whole issue is swept under the rug and forgotten. Since when does God's word change if you're a Christian? Ministers do not teach about the day of rest any more and a large percentage of church goers go out shopping after a church service. When we were little our parents taught us right from wrong. If you're not taught, you’re not going to learn. If you're not taught about Sunday and the day of rest, you're not going to learn about it. that we wake up and see what we are doing as a human race? I was into a local Irving on Dec 24th, to top up my gas. I will not shop or buy gas on a Sunday or a Holiday. One of the managers told me she wished they would close for at least one day a year. A company that huge making billions of dollars and they can not afford to let their employee's enjoy Christmas off. Capitalism obviously isn't working, after Sundays were taken from most employee's , companies want more and more. At what cost? Our churches are guilty for given up sermons that encourage Sundays as the day of rest. So if churches do not encourage human bonding, will Atheists preach about it? Will any other organizations step forward ? Religions have caused a lot of wars in history, but we have forgotten about all the good things that they do? We protect birds, we fine people for littering our roads and we are trying to protect our environment. Why aren't we protecting our families? Why aren't we promoting family life any more? We need to get back to the good old days. Christmas is about giving and what a special gift it would be to have public support . Not shopping on a Sunday! Planning and managing you're purchases so you don't have to shop. Being human is caring about one another. Not being selfish. Seriously do we need to watch movies at a theater on a Sunday? Knowing that we are responsible for them being there? Being responsible that he or she can not be home with their kids? All we have to do is stop shopping ! You can give a gift to someone with out it being of a material nature. By encouraging them to have that time home, by encouraging government legislation closing stores down. You do not have to be a Christian to be any less human ! An atheist also needs time to bond also with his or her families. Please share on any social media, ask one person to share and ask the other person share it too. On another note, I was on the Rick Howe show one morning and he said to me , isn't it time you give this up? Sunday shopping is here to stay? I can not give this up, we all have a gut feeling and this is one of them , that I have. A feeling not to give this up and speak up , hoping that our beautiful world with the people in it, will see what we have lost. It's not about shopping, it's about the human bonding, togetherness that we have all lost. I want to wish all of you a Happy New Year , and do not be afraid to speak up about family time and how important that is.